When it comes to our skin, sometimes the best approach is to keep things simple. We all have our favorite skin care products, but there’s a lot we can do to supplement our daily routine and ensure that our skin stays in great condition. Here are some amazing natural skin care tips from the experts. Peggy O’Kelley, CEO and founder of Napa Valley Bath Company, is an advocate of essential oils in everyday skin care. “Essential oils have been distilled from the plant kingdom since ancient times,” she says. “They have long been valued for their medicinal, spiritual and therapeutic value. Made up of tiny molecules that are easily absorbed into the body, they have been shown to enhance positive emotional and mental states as well as increase the body’s ability to heal.” For an uplifting facial scrub, O’Kelley mixes 1 cup of coconut oil with half a cup of sugar, adds 6 to 8 drops of blood orange essential oil, and stirs. “Massage face with the scrub in a circular upward motion. Rinse thoroughly and breathe deep!” she says. Celebrity facialist Ildi Pekar, who counts Miranda Kerr and Irina Shayk among her clients, recommends a parsley mask to help reduce redness, deliver hydration and boost skin radiance. Pekar mixes a handful of chopped parsley with 2 teaspoons of organic raw unfiltered apple cider vinegar and 3 teaspoons of organic plain yogurt, applies this to the skin and leaves it for 15 minutes. “Parsley contains an impressive amount of vitamin K which will reduce redness and promote a plump and healthy glow. Just 2 tablespoons of parsley contains 153% of the recommended daily amount of Vitamin K,” she says. What you put into your body is just as important for your skin as the products you put on it. 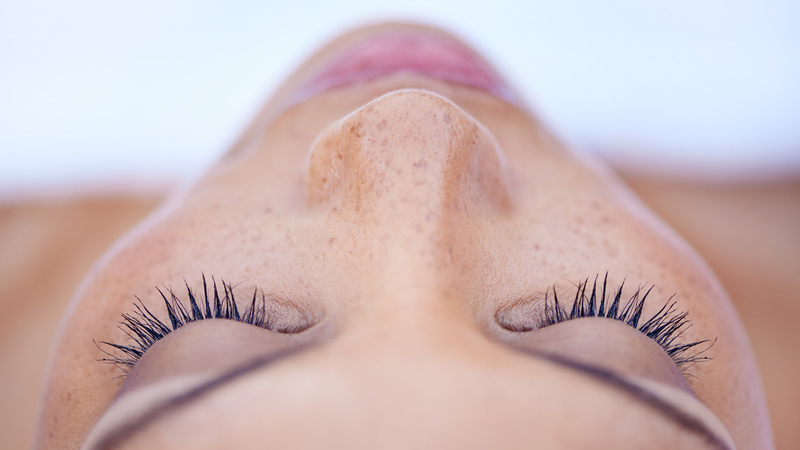 “Reduce your intake of sugar, hydrogenated oils, sodium and synthetic flavorings where possible,” advises Ben Johnson, MD, founder of the holistic beauty brand Osmosis Skincare. “Inflammation, even internally, stimulates oil production and leads to acne. Acne is a detox reaction that has little to do with bacteria or oiliness. It is poor digestion linked to what we eat and hormonal imbalances internally, not topical bacteria as we might think.” Johnson also recommends buying organic foods whenever possible, because the added growth hormones in our meat and dairy can end up in our bodies and result in hormone shifts, which can, in turn, contribute to acne. A gentle way to exfoliate your skin is with a konjac sponge, made from fibers of the root of the Asian konjac (“konnyaku”) plant. “The sponges may be used with plain water, or combined with a small amount of any facial cleanser,” says David Lortscher, MD, board-certified dermatologist and founder of Curology. “They have a mild exfoliating effect, without being too harsh on the skin.” Some konjac sponges are infused with other ingredients, such as green tea, charcoal or clay. External environments are important for your skin’s health as well. “Everything that is put onto your skin is absorbed directly into the body and into the bloodstream,” says Rebecca Lee, a registered nurse and founder of natural health resource RemediesForMe.com. Lee recommends cleaning pillowcases and sheets regularly to get rid of dead skin cells and oils. “Contact between your skin and your dirty pillowcases can irritate your gentle skin and clog pores,” she explains. Honey can give you smoother and cleaner skin — in more ways than one. Lee recommends incorporating raw, organic honey into your diet by using it to sweeten your tea or adding it to your salad dressing. You can also apply honey directly to your skin to soothe and moisturize. “Leave it on for a few minutes, then rinse it off with warm water,” she says.